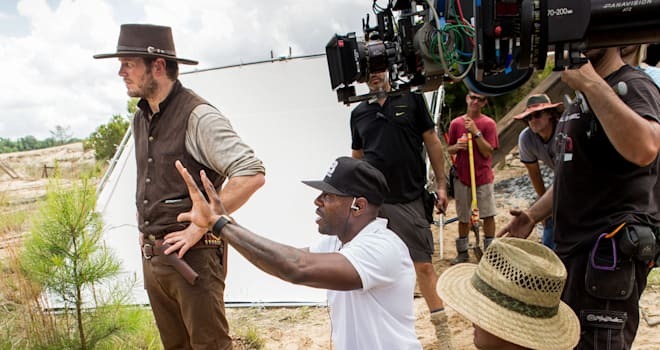 Antitione Fuqua is back and so is the western genre in The Magnificent 7. Fuqua has once again proved he is one of the best and most versatile directors on the planet. The man makes good movies that are fun to watch and this is no exception. The Magnificent 7 is the retelling of the classic story that we all know and love. Drifting from the original Seven Samurai script and later retold originally as Mag 7 in 1960. This film has its differences from the originals but all in the same draws some influence. Denzel Washington (Yes in a Western) stars as Sam Chisolm who is the no nonsense leader of the seven. Washington is on top of his game here as always. Working with Fuqua seems to bring the best out of him as in Training Day and The Equalizer. Washington should consider more westerns, he knocks this one out of the park. I as many others was excited to see Chris Pratt in a western as well. He is great for the most part, but in some ways it was evident to see that he resulted to his usual humor rather than his character’s personality. Vincent D’Onofrio is incredibly over the top in his role as Jack Horn. Over the top as it was, it totally worked in what the film was trying to do. I loved his character. With the exception of Red Harvest, all of the characters are very well flushed out. The Magnificent 7 is successful mostly because of its great cast, director and knowing what it is. It wasn’t trying to be anything more than it was. Which was a fun popcorn movie and modern age western. The Western genre has returned, now lets hope it sticks around for awhile.